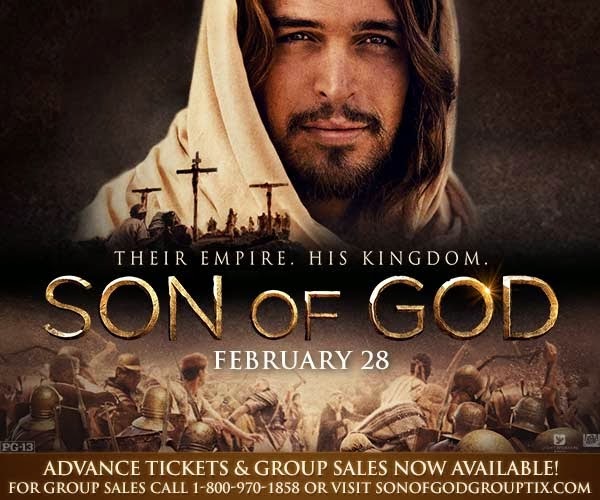 Kelly's Korner: Son of God - Win a pair of tickets to see the movie! Son of God - Win a pair of tickets to see the movie! Mark Burnett - the creator of Survivor, The Voice, The Apprentice, and Shark Tank and his wife Roma Downey created the Bible Series for TV last year. And now they have created a movie about the life of Jesus. It comes out THIS Friday and it's going to be AMAZING!!! I am so glad that Roma and Mark have used their talents and platform to share Jesus with the world this way. Compassion International is partnering with Roma and Mark on this movie. They are working together to share Jesus and to help children in poverty. And I have an amazing offer!! I am going to give FOUR lucky winners a pair of FREE tickets to see the movie! If you would like to win - just leave me a comment and tell me why you would like to see this movie or why you would like to give it to someone to see it. This could be a great opportunity to invite a friend to see a movie that might change their lives!